In Taiwan, they developed green luminous piglets. The goal of their fluorescent cells is to help facilitate the work of geneticists. Three green glowing male piglets were born thanks to the efforts of scientists from the National Taiwan University. Professor Shin-Zhi expressed the hope that their appearance will help in further research of stem cells research. Embryos with fluorescent green Jellyfish protein was introduced into eight sows, but only four of them became pregnant, and only three pregnancies ended with successful delivery. The piglets have a greenish tinge even in ordinary daylight, and in the ultraviolet rays they look quite bright green. According to Shin-Zhi, this new generation of green piglets allow fluorescence visually, without resorting to biopsy or other complex procedures, to observe the development of tissues during stem cell transplantation. 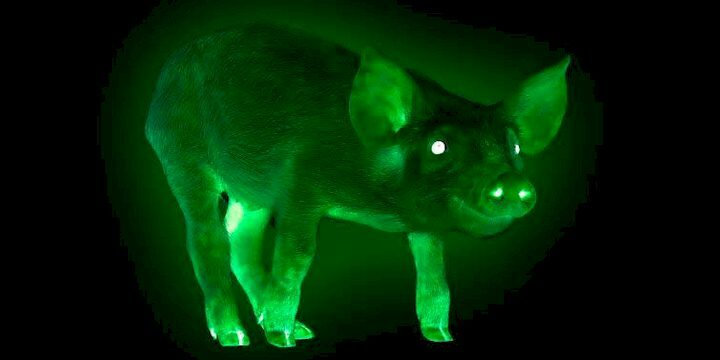 Fluorescent green pigs already existed, the scientist says, but only a partial fluorescence has been observed in pigs taken to this day. The animals we have developed are the only pigs in the world who have even a heart and internal organs of green color. The researchers hope the pigs will boost the island's stem cell research, as well as helping with the study of human disease. The scientists, from the National Taiwan University's Department of Animal Science and Technology, say that although the pigs are glow, they are otherwise no different from any others.